Stormwater is a big issue in Philly. All of our water runs into the same sewers (a “combined sewer system”), whether it’s water from everyday living in houses and buildings, or water coming from the sky. When there are rainstorms over the vast impermeable surfaces of our large city, that extra water (which could sink naturally into the ground in another environment) makes our sewers overflow, which is dangerous for us and our waterways. It’s one thing to tell the owners and managers of large properties in Philadelphia that they need to shrink the amount of stormwater running off of their buildings and land, but it’s another thing to help people actually implement these changes, which can be expensive and hard to understand. Azavea, a Philly-based certified B Corporation that creates civic geospatial software and data analytics (think harnessing data from maps and physical spaces to solve problems of modern city life) teams with the Philadelphia Water Department (PWD) to make this help a reality. 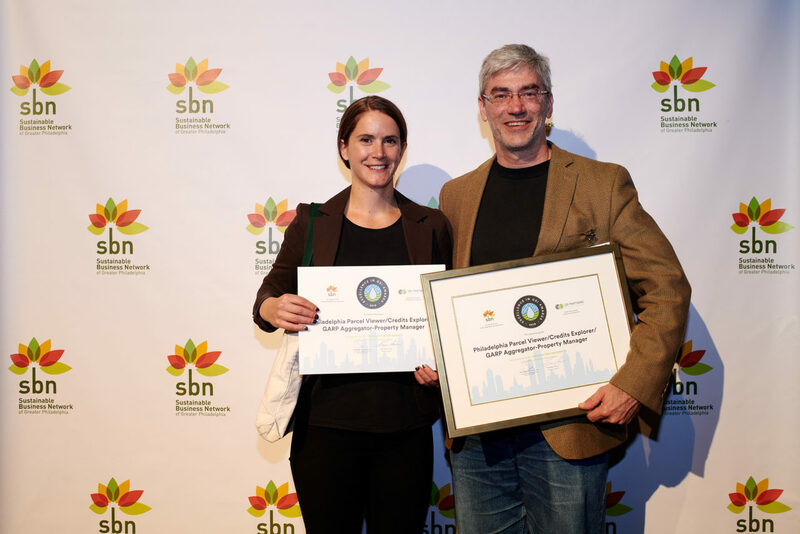 And now, the Sustainable Business Network has recognized them with an award for innovation. Arianna Robbins is the project manager for Azavea’s Parcel Viewer app, and she says her team has been partnering with PWD for about eight years to develop a trio of online tools for large-scale property owners to understand and tackle their burdens on Philly’s sewers, making life better for everyone—and saving money. Azavea’s stormwater management apps, with their PWD partners, won an Excellence in GSI Award in the category of Innovation. Azavea’s original stormwater app, Parcel Viewer, was developed in its most basic form to help large property owners make sense of the city’s change from billing based solely on the water meter to billing based on how much runoff your property is causing, with surfaces that can’t absorb, divert, or slow down the stream. Properties causing more runoff get bigger PWD fees. “Parcel Viewer is focused on showing Water Department customers their water bills, and specifically their stormwater charges in greater detail,” Robbins explains. From there, Azavea also developed the Credits Explorer app (launched in 2015), which took things further by allowing users to explore different remediation options, like green roofs, permeable pavement, rain gardens, or subsurface storage. Then, using the app, owners view the potential impact of each project, and calculate how much money they could save in PWD fees. Individual residential property-owners can use the apps too, she says, but don’t benefit like large property-owners, because PWD charges a flat stormwater fee for individual small properties, while large developments have variable fees. What do the remediations look like? Erin Williams, who manages PWD’s Stormwater Billing and Incentives Program, says one of the most common are rain gardens, but not everyone can dedicate that kind of space, so another option is an underground filtration system. Picture the ground under a parking lot, Williams says. Instead of just dirt, you could lay a system of plastic pipes in a large bed of gravel, wrapped in durable fabric. Every drain on the property connects to this hidden pipe bed, instead of letting water gush into the sewer. “So the intention is for the water to be able to collect there, and then slowly drain … or if the water can’t penetrate, the systems are designed to hold the water for a period of time, and then slowly drain it back into our sewer,” when it’s not overwhelming. Expensive to do? Yes. But PWD has a variety of grants that, in many cases, cover construction costs. “We have a huge interest in getting the stormwater managed,” Williams explains. And then, property owners can reap the benefit of lower fees. Both Robbins and Williams say these apps are on the forefront of stormwater management across the country. Industry professionals in other cities, like New York and D.C., are taking notice. Robbins and Williams are excited to have their work recognized and look forward to seeing it replicated in other cities that need the help.